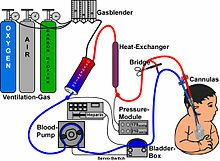 ECMO was first developed in the 1950s by John Gibbon, and then by Lillehei. The first use for neonates was in 1965. Hypothermia, with a core temperature between 28 and 24 °C and cardiac instability, or with a core temperature below 24 °C. In those with cardiac arrest or cardiogenic shock, it appears to improve survival and good outcomes. Early studies had shown survival benefit with use of ECMO for people in acute respiratory failure especially in the setting of acute respiratory distress syndrome. A registry maintained by ELSO of nearly 51,000 people that have received ECMO has reported outcomes with 75% survival for neonatal respiratory failure, 56% survival for pediatric respiratory failure, and 55% survival for adult respiratory failure. Other observational and uncontrolled clinical trials have reported survival rates from 50 to 70 percent. These reported survival rates are better than historical survival rates. Even though ECMO is used for a range of conditions with varying mortality rates, early detection is key to prevent the progression of deterioration and increase survival outcomes. In the United Kingdom, veno-venous ECMO deployment is concentrated in designated ECMO centers to potentially improve care and promote better outcomes. Futility: those who are too sick, have been on conventional therapy too long, or have a fatal diagnosis. Veno-arterial (VA) ECMO for cardiac or respiratory failure. Veno-venous (VV) ECMO for respiratory failure. There are several forms of ECMO; the two most common are veno-arterial (VA) ECMO and veno-venous (VV) ECMO. In both modalities, blood drained from the venous system is oxygenated outside of the body. In VA ECMO, this blood is returned to the arterial system and in VV ECMO the blood is returned to the venous system. In VV ECMO, no cardiac support is provided. In veno-arterial (VA) ECMO, a venous cannula is usually placed in the right or left common femoral vein for extraction, and an arterial cannula is usually placed into the right or left femoral artery for infusion. The tip of the femoral venous cannula should be maintained near the junction of the inferior vena cava and right atrium, while the tip of the femoral arterial cannula is maintained in the iliac artery. In adults, accessing the femoral artery is preferred because the insertion is simpler. Central VA ECMO may be used if cardiopulmonary bypass has already been established or emergency re-sternotomy has been performed (with cannulae in the right atrium(or SVC/IVC for tricuspid repair) and ascending aorta). VA ECMO is typically reserved when native cardiac function is minimal to mitigate increased cardiac stroke work associated with pumping against retrograde flow delivered by the aortic cannula. In veno-venous (VV) ECMO, cannulae are usually placed in the right common femoral vein for drainage and right internal jugular vein for infusion. Alternatively, a dual-lumen catheter is inserted into the right internal jugular vein, draining blood from the superior and inferior vena cavae and returning it to the right atrium. ECMO should be performed only by clinicians with training and experience in its initiation, maintenance, and discontinuation. ECMO management is commonly performed by a Respiratory Therapist or a Perfusionist. Once it has been decided that ECMO will be initiated, the patient is anticoagulated with intravenous heparin to prevent thrombus formation from clotting off the oxygenator. Prior to initiation, an IV bolus of heparin is given and measured to ensure that the ACT is between 300-350 seconds. Once the ACT is between this range, ECMO can be initiated and a heparin drip will be started after as a maintenance dose. Cannulae can be placed percutaneously by the Seldinger technique, a relatively straightforward and common method for obtaining access to blood vessels, or via surgical cutdown. The largest cannulae that can be placed in the vessels are used in order to maximize flow and minimize shear stress. ECMO required for complications post-cardiac surgery can be placed directly into the appropriate chambers of the heart or great vessels. Central cannulation via lateral thoracotomy allows patients awaiting lung transplantation to remain unsedated and ambulatory. 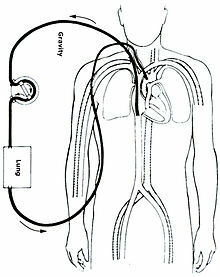 Following cannulation and connection to the ECMO circuit, the appropriate amount of blood flow through the ECMO circuit is determined using hemodynamic parameters and physical exam. Goals of maintaining end-organ perfusion via ECMO circuit are balanced with sufficient physiologic blood flow through the heart to prevent stasis and subsequent formation of blood clot. 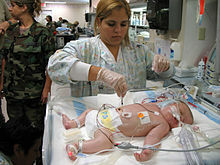 A respiratory therapist takes a blood sample from a newborn in preparation for ECMO therapy. Once the initial respiratory and hemodynamic goals have been achieved, the blood flow is maintained at that rate. Frequent assessment and adjustments are facilitated by continuous venous oximetry, which directly measures the oxyhemoglobin saturation of the blood in the venous limb of the ECMO circuit. VV ECMO is typically used for respiratory failure, while VA ECMO is used for cardiac failure. 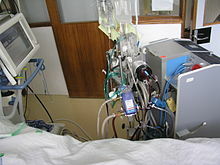 There are unique considerations for each type of ECMO, which influence management. Near-maximum flow rates are usually desired during VV ECMO to optimize oxygen delivery. In contrast, the flow rate used during VA ECMO must be high enough to provide adequate perfusion pressure and venous oxyhemoglobin saturation (measured on drainage blood) but low enough to provide sufficient preload to maintain left ventricular output. Since most people are fluid-overloaded when ECMO is initiated, aggressive diuresis is warranted once the person is stable on ECMO. Ultrafiltration can be easily added to the ECMO circuit if the person has inadequate urine output. ECMO "chatter", or instability of ECMO waveforms, represents under-resuscitation and would support cessation of aggressive diuresis of ultrafiltration. Left ventricular output is rigorously monitored during VA ECMO because left ventricular function can be impaired from increased afterload, which can in turn lead to formation of thrombus within the heart. For those with respiratory failure, improvements in radiographic appearance, pulmonary compliance, and arterial oxyhemoglobin saturation indicate that the person may be ready to be taken off of ECMO support. For those with cardiac failure, enhanced aortic pulsatility correlates with improved left ventricular output and indicates that they may be ready to be taken off of ECMO support. If all markers are in good status, the blood flows on the ECMO will be slowly decreased and the patients parameters will be observed during this time to ensure that the patient can tolerate the changes. When the flows are below 2 liters per minute, permanent removal is attempted and the patient is continued to be monitored during this time until the cannulae can be removed. VV ECMO trials are performed by eliminating all countercurrent sweep gas through the oxygenator. Extracorporeal blood flow remains constant, but gas transfer does not occur. They are then observed for several hours, during which the ventilator settings that are necessary to maintain adequate oxygenation and ventilation off ECMO are determined as indicated by arterial and venous blood gas results. 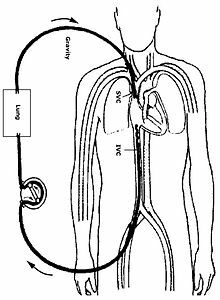 VA ECMO trials require temporary clamping of both the drainage and infusion lines, while allowing the ECMO circuit to circulate through a bridge between the arterial and venous limbs. This prevents thrombosis of stagnant blood within the ECMO circuit. In addition, the arterial and venous lines should be flushed continuously with heparinized saline or intermittently with heparinized blood from the circuit. In general, VA ECMO trials are shorter in duration than VV ECMO trials because of the higher risk of thrombus formation. A common consequence in ECMO-treated adults is neurological injury, which may include intracerebral hemorrhage, subarachnoid hemorrhage, ischemic infarctions in susceptible areas of the brain, hypoxic-ischemic encephalopathy, unexplained coma, and brain death. Bleeding occurs in 30 to 40 percent of those receiving ECMO and can be life-threatening. It is due to both the necessary continuous heparin infusion and platelet dysfunction. Meticulous surgical technique, maintaining platelet counts greater than 100,000/mm3, and maintaining the target activated clotting time reduce the likelihood of bleeding. Heparin-induced thrombocytopenia (HIT) is increasingly common among people receiving ECMO. When HIT is suspected, the heparin infusion is usually replaced by a non-heparin anticoagulant. There is retrograde blood flow in the descending aorta whenever the femoral artery and vein are used for VA ECMO. Stasis of the blood can occur if left ventricular output is not maintained, which may result in thrombosis. The CESAR study has shown an improvement in 6 month survival without severe disability in patients getting ECMO versus conventional ventilation in ARDS. In VA ECMO, those whose cardiac function does not recover sufficiently to be weaned from ECMO may be bridged to a ventricular assist device (VAD) or transplant. A variety of complications can occur during cannulation, including vessel perforation with bleeding, arterial dissection, distal ischemia, and incorrect location (e.g., venous cannula placed within the artery), but these events occur highly infrequently. Preterm infants are at unacceptably high risk for intraventricular hemorrhage (IVH) if administered ECMO at a gestational age less than 32 weeks. A 2014 study showed that a factor XIIa inhibitory antibody provides thromboprotection in extracorporeal circulation without increasing bleeding risk. Experiments on neonatal animals showed that ECMO treatment can lead to apoptosis of enterocytes, damage of the intestinal mucosal barrier and bacterial translocation. This might explain greater severity of systemic inflammatory response syndrome in neonates. ECMO has also seen its use on cadavers as being able to increase the viability rate of transplanted organs. ^ "Pediatric Extracorporeal Membrane Oxygenation". ^ Mosier, Jarrod M.; Kelsey, Melissa; Raz, Yuval; Gunnerson, Kyle J.; Meyer, Robyn; Hypes, Cameron D.; Malo, Josh; Whitmore, Sage P.; Spaite, Daniel W. (2015). 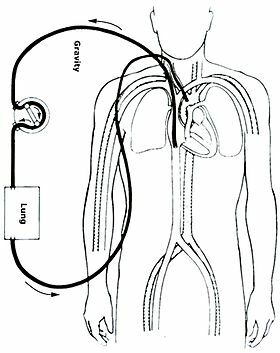 "Extracorporeal membrane oxygenation (ECMO) for critically ill adults in the emergency department: history, current applications, and future directions". Critical Care. 19. doi:10.1186/s13054-015-1155-7. ^ "General Guidelines for all ECLS Cases" (PDF). Extracorporeal Life Support Organization. Retrieved April 15, 2015. ^ State of New Hampshire Patient Care Protocols v7. New Hampshire: NH Medical Control Board. 2018. p. 2.10. ^ Ouweneel, DM; Schotborgh, JV; Limpens, J; Sjauw, KD; Engström, AE; Lagrand, WK; Cherpanath, TG; Driessen, AH; de Mol, BA; Henriques, JP (September 19, 2016). "Extracorporeal life support during cardiac arrest and cardiogenic shock: a systematic review and meta-analysis". Intensive Care Medicine. 42 (12): 1922–1934. doi:10.1007/s00134-016-4536-8. PMC 5106498. PMID 27647331. ^ Peek, GJ; Moore, HM; Moore, N; Sosnowski, AW; Firmin, RK (1997). "Extracorporeal membrane oxygenation for adult respiratory failure". Chest. 112 (3): 759–64. doi:10.1378/chest.112.3.759. PMID 9315812. ^ Lewandowski, K.; Rossaint, R.; Pappert, D.; Gerlach, H.; Slama, K.-J. ; Weidemann, H.; Frey, D. J. M.; Hoffmann, O.; Keske, U. (1997). "High survival rate in 122 ARDS patients managed according to a clinical algorithm including extracorporeal membrane oxygenation". Intensive Care Medicine. 23 (8): 819–35. doi:10.1007/s001340050418. PMID 9310799. ^ Paden, Matthew L.; Conrad, Steven A.; Rycus, Peter T.; Thiagarajan, Ravi R. (April 1, 2017). "Extracorporeal Life Support Organization Registry International Report 2016". ASAIO Journal. 63 (1): 60–67. doi:10.1097/MAT.0000000000000475. PMID 27984321. ^ Hemmila, Mark R.; Rowe, Stephen A.; Boules, Tamer N.; Miskulin, Judiann; McGillicuddy, John W.; Schuerer, Douglas J.; Haft, Jonathan W.; Swaniker, Fresca; Arbabi, Saman (2004). "Extracorporeal Life Support for Severe Acute Respiratory Distress Syndrome in Adults". Annals of Surgery. 240 (4): 595–605, discussion 605–7. doi:10.1097/01.sla.0000141159.90676.2d. PMC 1356461. PMID 15383787. ^ Brogan, Thomas V.; Thiagarajan, Ravi R.; Rycus, Peter T.; Bartlett, Robert H.; Bratton, Susan L. (2009). "Extracorporeal membrane oxygenation in adults with severe respiratory failure: A multi-center database". Intensive Care Medicine. 35 (12): 2105–14. doi:10.1007/s00134-009-1661-7. PMID 19768656. ^ Kolla, S; Awad, SS; Rich, PB; Schreiner, RJ; Hirschl, RB; Bartlett, RH (1997). "Extracorporeal life support for 100 adult patients with severe respiratory failure". Annals of Surgery. 226 (4): 544–64, discussion 565–6. doi:10.1097/00000658-199710000-00015. PMC 1191077. PMID 9351722. ^ Rich, PB; Awad, SS; Kolla, S; Annich, G; Schreiner, RJ; Hirschl, RB; Bartlett, RH (1998). "An approach to the treatment of severe adult respiratory failure". Journal of Critical Care. 13 (1): 26–36. doi:10.1016/S0883-9441(98)90026-0. PMID 9556124. ^ Ullrich, R; Lorber, C; Röder, G; Urak, G; Faryniak, B; Sladen, RN; Germann, P (1999). "Controlled airway pressure therapy, nitric oxide inhalation, prone position, and extracorporeal membrane oxygenation (ECMO) as components of an integrated approach to ARDS". Anesthesiology. 91 (6): 1577–86. doi:10.1097/00000542-199912000-00007. PMID 10598597. ^ Lich, Byran (2004). The Manual of Clinical Perfusion (2nd ed.). Fort Myers, Florida: Perfusion.com. ISBN 978-0-9753396-0-2. ^ a b c Madershahian, Navid; Nagib, Ragi; Wippermann, Jens; Strauch, Justus; Wahlers, Thorsten (2006). "A Simple Technique of Distal Limb Perfusion During Prolonged Femoro-Femoral Cannulation". Journal of Cardiac Surgery. 21 (2): 168–9. doi:10.1111/j.1540-8191.2006.00201.x. PMID 16492278. ^ Wang, Dongfang; Zhou, Xiaoqin; Liu, Xiaojun; Sidor, Bill; Lynch, James; Zwischenberger, Joseph B. (2008). "Wang-Zwische Double Lumen Cannula—Toward a Percutaneous and Ambulatory Paracorporeal Artificial Lung". ASAIO Journal. 54 (6): 606–11. doi:10.1097/MAT.0b013e31818c69ab. PMID 19033774. ^ Lich, Bryan (2004). The Manual of Clinical Perfusion (2nd ed.). Fort Myers, Florida: Perfusion.com. p. 143. ISBN 978-0-9753396-0-2. ^ Chierichetti, M.; Santini, A.; Pagan, F.; Crotti, S.; Lissoni, A.; Gattinoni, L. (2012). "ECMO in nonintubated patients as a bridge to lung transplant: Our experience". Critical Care. 16: P97. doi:10.1186/cc10704. ^ Cohen, Gordon; Permut, Lester (2005). "Decision making for mechanical cardiac assist in pediatric cardiac surgery". Seminars in Thoracic and Cardiovascular Surgery: Pediatric Cardiac Surgery Annual. 8: 41–50. doi:10.1053/j.pcsu.2005.02.004. PMID 15818357. ^ Vural, Kerem M. (2008). "Ventricular assist device applications". Anadolu Kardiyoloji Dergisi. 8 (Suppl 2): 117–130. PMID 19028644. ^ Lich, Bryan (2004). The Manual of Clinical Perfusion (2nd ed.). Fort Myers, Florida: Perfusion.com. p. 149. ISBN 978-0-9753396-0-2. ^ Mateen, Farrah J.; Muralidharan, R.; Shinohara, R. T.; Parisi, J. E.; Schears, G. J.; Wijdicks, E. F. (2011). "Neurological Injury in Adults Treated With Extracorporeal Membrane Oxygenation". Archives of Neurology. 68 (12): 1543–9. doi:10.1001/archneurol.2011.209. PMID 21825216. Retrieved August 8, 2013. ^ Cornell, Timothy; Wyrick, Polly; Fleming, Geoffrey; Pasko, Deborah; Han, Yong; Custer, Joseph; Haft, Jonathan; Annich, Gail (2007). "A Case Series Describing the Use of Argatroban in Patients on Extracorporeal Circulation". ASAIO Journal. 53 (4): 460–3. doi:10.1097/MAT.0b013e31805c0d6c. PMID 17667231. ^ Peek GJ, Mugford M, Tiruvoipati R, Wilson A, Allen E, Thalanany MM, Hibbert CL, Truesdale A, Clemens F, Cooper N, Firmin RK, Elbourne D (October 2009). "Efficacy and economic assessment of conventional ventilatory support versus extracorporeal membrane oxygenation for severe adult respiratory failure (CESAR): a multicentre randomised controlled trial". Lancet. 374 (9698): 1351–63. doi:10.1016/S0140-6736(09)61069-2. PMID 19762075. ^ Jobe, Alan H. (2004). "Post-conceptional age and IVH in ECMO patients". The Journal of Pediatrics. 145 (2): A2. doi:10.1016/j.jpeds.2004.07.010. ^ Larsson M, Rayzman V, Nolte MW, et al. (January 2014). "A Factor XIIa Inhibitory Antibody Provides Thromboprotection in Extracorporeal Circulation Without Increasing Bleeding Risk". Sci. Transl. Med. 6 (222): 222. doi:10.1126/scitranslmed.3006804. PMID 24500405. ^ MohanKumar K (February 2014). "Intestinal epithelial apoptosis initiates gut mucosal injury during extracorporeal membrane oxygenation in the newborn piglet". Lab. Invest. 94 (2): 150–160. doi:10.1038/labinvest.2013.149. PMC 3946757. PMID 24365747. ^ Magliocca, JF; Magee, JC; Rowe, SA; Gravel, MT; Chenault Rh, 2nd; Merion, RM; Punch, JD; Bartlett, RH; Hemmila, MR (2005). "Extracorporeal support for organ donation after cardiac death effectively expands the donor pool". The Journal of Trauma. 58 (6): 1095–101, discussion 1101–2. doi:10.1097/01.ta.0000169949.82778.df. PMID 15995454.